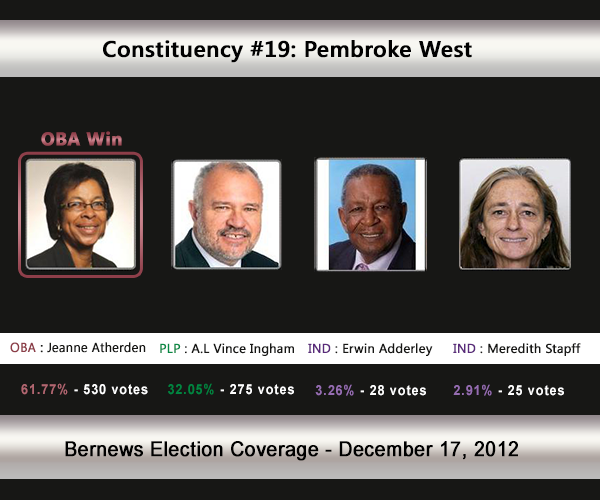 [UPDATE Dec 17: Election Results] Jeanne Atherden [OBA] has defeated Vince Ingham [PLP], her brother Erwin Adderley [IND] and Meredith Stapff [IND] in C#19 Pembroke West. The incumbent was Shawn Crockwell [OBA]. Pembroke West will see a four-way battle, sibling rivalry and a new MP for the area elected as the incumbent Shawn Crockwell [OBA] has moved to Constituency #31 Southampton West Central. Vince Ingham will stand for the PLP, Jeanne Atherden will stand for the OBA, while her brother Erwin Adderley will stand as an Independent. Meredith Stapff was a late entrant to the race, registering on Nomination Day. In 2007 Mr Crockwell [under UBP] won 58% of the vote vs the PLP’s Walton Brown [505-361]. In the 2003 General Election, Jamahl Simmons [UBP] won with 64.23% of the vote against Calvin Smith [PLP] who received 35.77%. 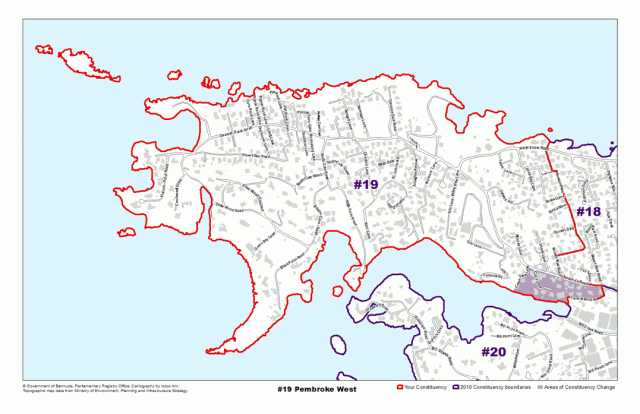 The areas the Pembroke West constituency consists of, or is located by, includes St. John’s Road, Sunset View Road, Creek View Lane, Sunset Pass, North Shore Road, Sunset Pass and more. Mr. A. L. Vincent Ingham, J.P., Eng. is a forward-looking leader and strategic thinker within the field of engineering, the electric utility business and as an avid volunteer in a number of community activities. Mr. Ingham attended West Pembroke Primary School & The Berkeley Institute. He then attended and graduated from Dalhousie University with a Bachelor of Science degree and holds a Bachelor of Mechanical Engineering from Dalhousie University and Nova Scotia Technical College, as well as a Master of Business Administration from Nova University. His career in the electric utility business began over 30 years ago, when he first joined Bermuda Electric Light Company Limited (BELCO) in 1972 as an engineer and soon after achieved his status as a professional engineer. In 1980 he joined Conyers Dill & Pearman, a leading Bermuda law firm, as Corporate Manager. He returned to BELCO in 1986 in the role of Senior Mechanical Engineer. Over the next fifteen years at BELCO, he was awarded several promotions, most notably successfully fulfilling the role of Senior Vice President in 1994, Executive Vice President in 1997 and Executive Vice President & Chief Operating Officer of BELCO in December 2001. On July 1, 2007 he was appointed President & Chief Executive Officer of BELCO and soon after as President & Chief Executive Officer of Ascendant Group Limited on January 1, 2008. Mr. Ingham is passionate about making a difference in the community and dedicates a significant amount of his personal time to many local, government, education and professional organizations. As a Professional Engineer, registered in both Bermuda and the Province of Nova Scotia, he has served as President of the Bermuda Association of Professional Engineers and as Chairman of the Bermuda Professional Engineers Registration Council. He was the first Chairman of the Bermuda Land Development Company and has served on the Government Employment Tribunal, the Bermuda Chamber of Commerce, the Essential Industries Disputes Settlement Board, Telecommunications & Broadcasting Commission, Airport Advisory Committee and as a member of the Bermuda College Strategic Plan Action Team. He is a past Chairman of the Warwick Academy Board of Directors and currently serves as Chairman of the Board of Education and Board of Tourism. He is a member of the Board of Caribbean Electric Utility Services Corporation (CARILEC) and the Bermuda First Steering Committee. Mr. Ingham was appointed as a Progressive Labour Party Senator in November 2011, and is the Junior Minister for Public Works, Business Development and Tourism. Jeanne Atherden is a Vice-President of Paragon Brokers (Bermuda) Ltd. She is also Chairman of the Board of Trustees of the Hotel Pension Fund and Deputy Chairman of KeyTech Limited. Jeanne graduated from McGill University in Montreal with a B.Commerce and obtained a Chartered Accountant designation. She is a member of the Institute of Chartered Accountants of Bermuda and the Institute of Chartered Accountants of Quebec. A very active member of the community, she holds the following positions in local groups: 2011 PGA Grand Slam of Golf Admissions Chairperson (3 years), RBT Education Awards Committee Chairman (5 years), The Bank of Bermuda Youth Development Sub- Committee member (5 years). She was appointed a Senator in 2008 and served for 3 years. At the time of her resignation from the Senate, she was the Opposition Leader in the Senate and the Shadow Minister of Economy, Trade and Industry. She also spoke for Finance in the Senate. Jeanne is the immediate past Chairman of the UBP. Jeanne believes that working together we can do more and encourages everyone to get involved, especially women. She has served as a member of the Executive and President of OWIT, an organization to promote women in international trade, for several years and mentored many young women as they climbed the corporate ladder. She is married and has two daughters and one grandson. She is an avid golfer. Erwin P. Adderley JP is a former Deputy Leader of The United Bermuda Party (UBP), a former Minister of Transport, a former Shadow Minister of Public Works, and a former Director of Planning. Erwin was first elected to parliament in a bye election in 1997 to represent the constituency of Pembroke West # 19. He was re-elected in the General Election held in 1998 and represented the constituency for 6 years. In the 2003 General Election Erwin chose to contest Constituency #18 where the Adderley family home is located. That bid did not succeed and he left day-to-day politics to concentrate on running Erwin P. Adderley Associates Ltd., his successful planning, design and development consultancy business. Erwin did not retire from politics, he remained keenly interested in the affairs of Bermuda and those of Pembroke West, when he moved back to the family home at 7 North Court Avenue, Pembroke, where he has lived since 2005. Erwin believes a Member of Parliament’s first duty is to the people he or she represents – staying in touch, keeping an ear to the ground and being available at all times. Erwin attended the Central School (now Victor Scott School), and the Berkeley Institute. He graduated from The University of Nebraska with Bachelor’s Degree and a Masters degree in Architecture. He went on to obtain a Masters degree in City and Regional Planning from The University of British Columbia. Erwin worked in Alberta, Canada, first as a planner, then as The Director of Planning for the Old Man River Regional Planning Authority which included the planning for the city of Lethbridge, which is the third largest city in the Province of Alberta. Erwin returned to Bermuda as The Director of Planning in 1972, a position that he held until 1994 when he retired to form his own firm: Erwin P. Adderley Associates Ltd.
During his tenure as Director of Planning, in addition to overseeing all Planning matters, which included the preparation of the 1974 Development Plan, the 1983 Development Plan, the 1988 Building Act and the initial preparation of The Bermuda Residential Building Code, he was also involved as an Ex. Officio member in the establishment and operations of The Bermuda Housing Corporation and The West End Development Corporation. Erwin was also a founding member of the Handyman Committee of Age Concern which was established to ensure that seniors were not taken advantage of on matters related to satisfying their building and construction needs. Erwin is a family man, married to Nathalie with two step children and four grandchildren. Delegates and Parliamentarians arriving at the Devonshire Recreation Club on 21 December 2012 for the leadership election, which saw Marc Bean selected over Terry Lister. One Bermuda Alliance supporters gathered at the Vasco Da Gama Club on Reid Street to celebrate their victory in the 2012 General Election. Following a five-week election campaign, thousands of voters began flocking to the island’s 36 polling stations when they opened at 8am on 17 December 2012 for the 2012 General Election. Advanced Polling got underway on December 11, 2012 at the Seventh Day Adventist Church Hall on King Street in Hamilton, with candidates out greeting voters. 87 political candidates made their way to the Seventh-Day Adventist Church on King Street on November 29 2012 for Nomination Day. Both the Progressive Labour Party and One Bermuda Alliance walked to the Church together, with their candidates decked out in their respective party colours, while a total of 15 Independents also registered. The 2012 Convening of Youth Parliament took place on November 15th at the House of Assembly, featuring an address by Youth Premier Ryan Robinson Perinchief. © 2019 Bernews: 2012 Election. All rights reserved.